This article from Bulletproof is so good I had to add it to Re-Blog for reference on Why PEMF therapy is a Game changer for all of us. Mitochondria, the battery packs of your cells, and how strong they are affects everything you do. What if you could charge up your mitochondria directly — in a sense, plug them in? PEMF therapy comes pretty close. 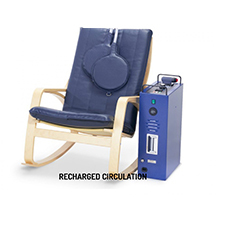 PEMF therapy uses bursts of low-level electromagnetic radiation to heal damaged tissues and bone, to relieve injury-related pain, and even to stimulate organs. It’s a safe level of EMFs. The therapeutic frequency of PEMFs look a lot like the frequencies you encounter in nature, so your body knows how to deal with it. Most PEMF treatments and maintenance will fall in the 5-30 Hz range, which is less than you get from a thunderstorm. 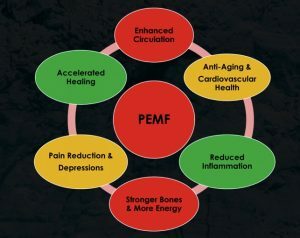 Research has demonstrated that PEMF healed bones faster, helped regenerate parts of the liver that had been removed, reduced pain from arthritis and more. At Bulletproof, there’s a lot of talk about mitochondria, the battery packs of your cells. How many mitochondria you have and how strong they are affect everything you do — from performing better to living longer. There are ways to boost your mitochondria through diet and lifestyle. But what if you could charge up your mitochondria directly — in a sense, plug them in? But does it work? Read on to find out the mechanism behind PEMF benefits, whether it’s harmful like the EMFs you hear about, and whether it can help you. The idea is that pulses at low frequencies will pass through the skin and penetrate deep into muscle, bones, tendons, and even organs to activate the cell’s energy and encourage its natural repair mechanisms. You may have heard that electromagnetic fields (EMFs) that come from things like wireless routers, microwaves, and airplanes disrupt your biology. EMFs can alter your DNA and reconfigure your genes, which can leave your cells not really knowing what to do. That can result in a lot of havoc, ranging from being tired all the time or ending up with DNA damage and cancer. PEMF therapy isn’t the same thing. Frequency and duration make all the difference. Even non-ionizing EMFs in the middle frequency (example: microwaves register around ten billion Hz) range can cause changes in your DNA and disrupt your circadian rhythm. What’s more is that, PEMF treatment is pulsed and brief, so you don’t have extended exposure like you would sitting under a cell phone tower all day. Most PEMF treatments last 10-20 minutes and deliver short bursts the whole time, instead of constant exposure. So, you can get all of the benefits of PEMF without the negative effects that come with man-made EMF sources like electronics. The idea behind it is that the energy pulses penetrate and stimulate cells at the injury site, and everywhere around it. So, introducing a low-level electromagnetic field into the body can bring those charges back up and restore healthy electrochemical exchanges. PEMFs stimulate every level of the body. You apply mats, pads, rings or paddles externally, and the electromagnetic pulses of energy penetrate the body at the cellular level. Your body then uses that energy to heal itself through its natural healing mechanisms. Depending on the extent of the issue, PEMFs can address a slight imbalance quickly, like a pulled muscle, or it can work to bring about a more substantial change over time, like restoring a sluggish organ system. Animal studies show the potential of PEMF therapy in regenerating nerve fibers in the spinal cord and peripheral nerves, which is promising for the future of regenerative medicine. In cell cultures, PEMF treatment seemed to activate lysozyme, which is a major step in the bone regeneration process. In a small study, people with rotator cuff injuries went through PEMF therapy, and all participants had either reduced or eliminated symptoms. Currently, insurance doesn’t cover the cost of PEMF therapy, so prepare to pay $50-60 per session. If extended therapy is needed, usually the clinic will offer session packages that will save you some money over the course of your treatment. 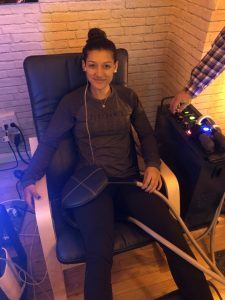 If you’re in the Manhattan NYC area, you can hit up LemonLightLounge.com for PEMF treatments. It’s completely reasonable to pay a couple hundred dollars for a series of sessions to treat a sore shoulder that’s been bugging you for decades, or to help a recent injury along. PEMF therapy is one of those things you have to experiment with yourself to see if you notice improvements. A one-off treatment may not do much, but a full course might surprise you. With scientific backing and no side effects, it’s worth a chat with your chiropractor about PEMF therapy.